I was recently asked by Sauder, to restyle and use a piece of furniture 3 ways. 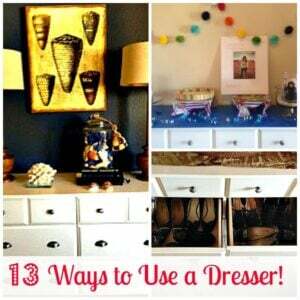 I am so glad that I chose a dresser because I found 13 Ways to Use a Dresser in my home. I welcome you ideas too! 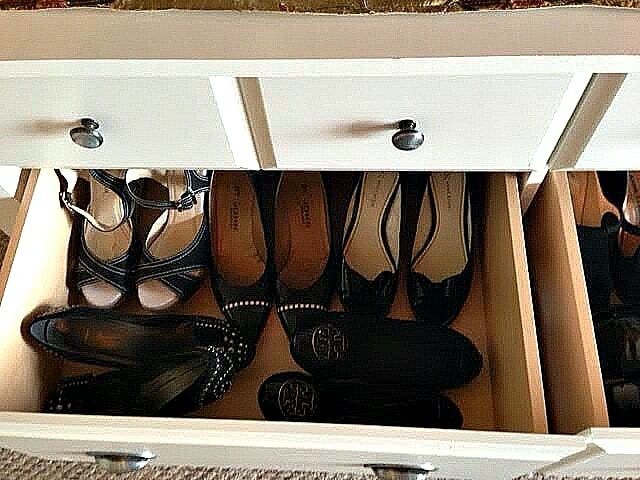 Dressers are the “multi-taskers” of furniture pieces. Last week, I wrote a review about my experience ordering a dresser with Sauder. You can read the entire review (with photos of the assembly done by my husband) right here, Sauder Furniture Review. I was given the tough job of selecting a piece of Sauder furniture to review! It took me several attempts browsing through their extensive online catalog to settle on a dresser as my selection. If you have not visited their website lately, it is much more than desks, and bookcases. You may be surprised at all the choices from bedroom furniture, side tables, kitchen and dining tables, dressers, TV stands, and more. Their prices are very affordable. 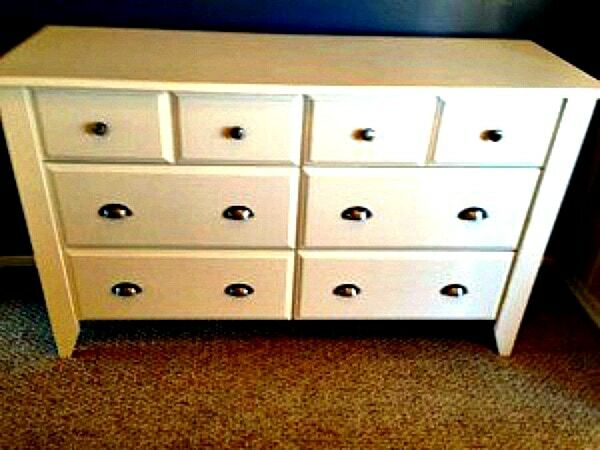 I finally decided on a 6 drawer dresser from the Shoal Creek collection which retails for $249.99. On their website, they have a fun, short quiz called Find Your Furniture Style. Find out how choosing your favorite flowers and paintings, objects of art, colors, favorite childhood memories and your current life phase translate into finding your decorating style. You can also browse through their Expedtion Design Style Lab for inspiration! Where are Those Moving Men Disks? Since coming home, the dresser has been moved around and re-purposed several times. A few years ago, when my daughter left for college, we downsized from a large home into a smaller condo. We are still moving furniture around and redecorating our smaller, cozier space. Right now, my downstairs is being transitioned into a more casual, and light space to reflect our southern California lifestyle. Our upstairs still has furniture and decor from our old house which was more formal. Since we did not want to get rid of everything, we slowly but surely have been adding new pieces and changing things up. 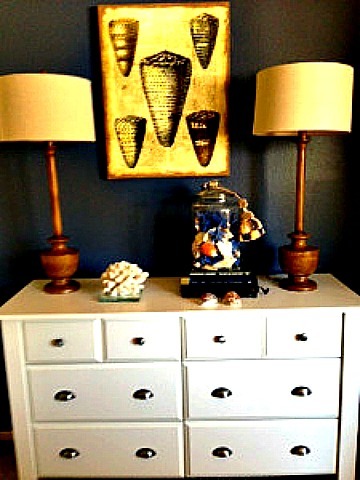 When my new Sauder dresser was finished, I tried it downstairs and decorated it in my new casual, light style with beach accents. Right now, our dresser is getting ready for a party! We are using it as a buffet for our “good-bye for now” party we are having for our daughter tomorrow as she leaves for graduate school. I am an empty-nester again! Need a multi-tasking dresser in your home too? a bill paying/organizing center for receipts, copies, warranties, etc. 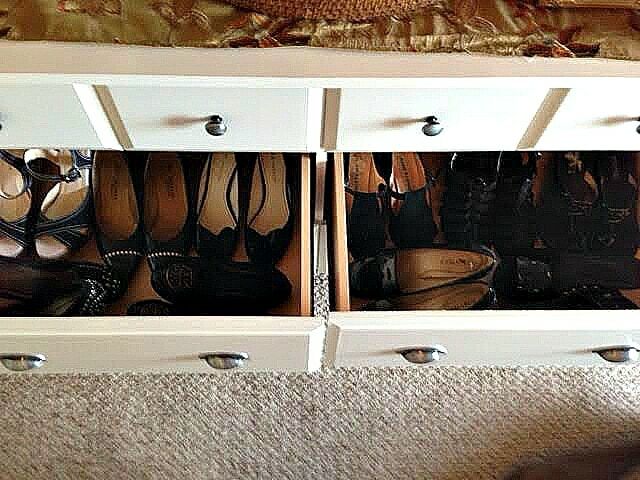 Extra shoe storage! yes, I have a shoe problem. Especially a black shoe problem, ( I counted 23 pairs of black shoes.) I have a hard time getting rid of things. Also, I may need an intervention. For certain, I needed more storage. All of my shoes were all stored at the bottom of my closet, I could not even see all of them, plus they were getting dusty. I am very pleased with the choice I made and with Sauder furniture. If you don’t mind assembling your furniture, you can include some very useful and stylish pieces into your decor for a very affordable price. There are over 30 collections to choose from. Sauder Furniture is a family-owned, n American Tradition going back to 1934, proudly making furniture in Archbold, Ohio. Like organizing and decorating tips? Me too! 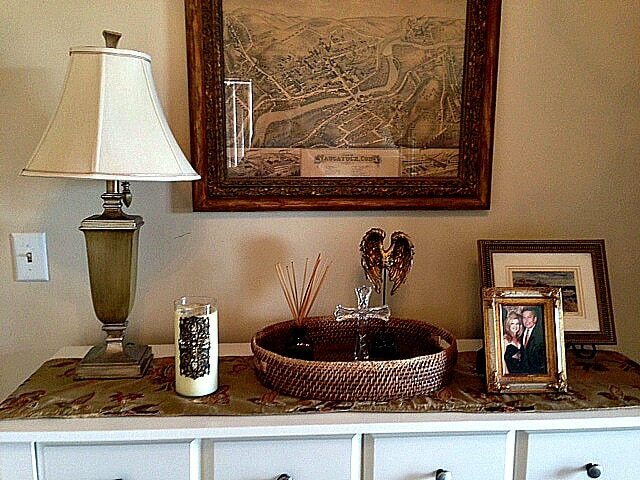 Follow me on Pinterest and be sure and re-pin my 13 Ways to Use a Dresser! Have You Ordered Furniture Online? From Sauder? What Would Your Review Say?